I might have missed something, but I really found Austin to not be all that great. I had looked at the University of Texas for graduate school and I had heard from many people that Austin was where it was at, but after making a visit to 6th St and the arboretum I was out of things to do. 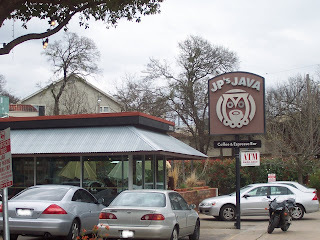 But what made the whole trip not so bad was a stop by JP's Java, a coffee establishment nestled in what appears to be an old auto garage with a cute (very small but aesthetically pleasing) parking lot. The exterior is accented by their big owlish logo (derived apparently from a Mayan calendar symbol) and amplified by the beautiful outside patio juxtaposed against a pair of beautifully converted garage doors. Walking inside there are multiple seating areas ranging from a small outcove to a large open room with lots of table space. JP's serves Zoka Coffee all the way out of Seattle (which it seems they deliver twice a week just around the third day after roasting to ensure quality). They boast a brace of Clovers which was definitely a welcome and pleasant sign. I sampled a Rwandan coffee which was a sweet and earthy brew seemingly devoid of bitterness. The espresso also impressed, as it had a velvety texture that led to a chocolaty sweetness and bright tang, not to mention that it was pulled very well. The tea looked to be free leaf and of a decent variety. I really enjoyed my visit to JP's and wish I could have hung out a little longer, as I really don't expect to be back in Austin anytime soon. But if you happen to be in town for business or pleasure (good luck on the latter), make sure to make a swing by JP's for the coffee. I am an ex-austinite (grew up there) and agree with you totally on your comments about Austin. What's the big deal? Not much. Great blog, excellent map tie-in. Austin is awesome. Town lake, zilker park, all the indie coffee places, UT football, great weather, some cool walkable neighborhoods, live music, Alamo Draft House, Mt bonnell, superb restaurants & hotels, cool people, movies get filmed there, I could go on and on. Anyway, so, so many better coffee shops than JP's. JP's is okay, but Mozart's, Cafe Medici, Halcyon, Progress, La Tazza Fresca, Clementine, and a few others probably rank higher in my book.